Spencer’s has a stock of groceries, fruits, veggies, meats, fresh breads, frozen foods and loads more. It’s massive, has perpetual super saver deals going on and is one of the best places to pick up salad ingredients from. Nope, here’s where things get interesting. 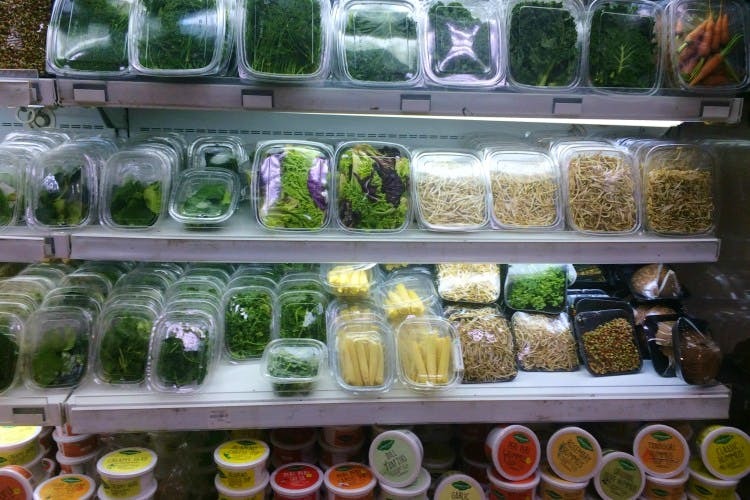 The fruits and vegetable section is loaded with Indian and imported produce and to make things easier for the working lot of the city—they’ve made a refrigerated section for DIY salads where the colours are so inviting, it will be a shame if you aren’t making your own salads. You could choose from individual vegetables, freshly cut and plastic wrapped, or indulge in pre-packed combos that add to the salad varieties you can make. Go a little further and add the flavours of fresh herbs, berries or fruits and make a wholesome bowl that will earn you your dessert. No salad is complete without a dressing! You can scour the aisle of prepared dressings, both Indian or imported, or make a little extra effort and make one from scratch. There’s usually a deal on olive oils, there are loads of seasonings and nuts and a bottle of good balsamic vinegar is best picked up from their international section. There you have it, a customised salad that’s perfect for a quick meal.